Are you looking for chef created meals made with the same high quality ingredients you use to cook during a Whole 30? Wish you could have Whole30 pre-made food stashed in the freezer for when you run out of time to cook? In this article we cover every Whole30 delivery service we’ve come across in our research. Finding a Whole30 meal prep service available in your area is not as difficult as you might imagine. In this article we cover the options from every angle of getting Whole30 Meal Delivery. If you’re reading this article, you’re either in the midst of, or just beginning to start your Whole30 challenge or have decided to make following the Whole 30 a long-term lifestyle choice. Perhaps you’re interested in losing weight, or maybe you’re trying to reset your healthy eating and gain more natural energy. Whatever your reasons, those who complete the Whole 30 have found themselves profoundly impacted by the lifestyle change. But following the Whole30 can be – well – challenging. Not only are you eliminating major food groups from your daily meals, but the diet’s specifications often require you to make your meals from scratch. For those who lead a busy life, it can be difficult to find time to shop for and cook meals compliant with the Whole30. But as the popularity of Whole30 has risen, so have the number of companies out there who offer pre-prepared Whole 30 meals that strictly follow all the requirements. Whether you’re interested in having an entire month’s supply of Whole30 meals shipped to your door, or you’re looking to keep a few freezer meals on hand for emergencies, this article covers the ins and outs of Whole30 delivery and take-home options. If you’re still trying to figure out if the Whole30 diet is feasible for you, check out our resources. Hopefully they’ll help! Although online meal-delivery services abound, there aren’t many that are dedicated to the Whole30 program and it’s specific philosophy and dietary requirement. If you’ve been searching for Whole30 meal delivery but have been coming up short, don’t worry! There are, in fact, companies that will ship grain, dairy, sugar, and legume-free Whole30 meals to any home or business address in the United States. 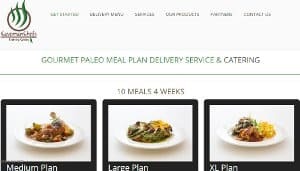 The companies we’ve listed below specialize in Paleo meals and meal planning, but they also specialize in creating meals compliant with Whole30 restrictions. These companies source their produce locally, working with vendors and farmers to create diverse and constantly changing menu options. If you’re interested in ordering Whole30 compliant meals made with organic produce, grass-fed meats, and hard to find game, take a look at the following companies. 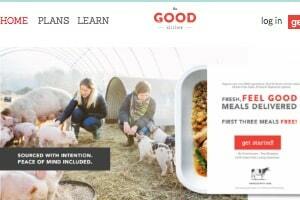 The North Carolina-based Good Kitchen, approved by the official Whole30 organization, prides itself on creating Paleo and Whole30 friendly meals made from non-gmo, organic produce, 100% grass fed and finished beef, pastured pork, poultry and eggs and Seafood Watch approved fish and seafood. Their weekly changing menu is based on the ingredients available at the local farms that they partner with based in their area which they encourage to use regenerative agriculture practices. They allow filtering their weekly menu by the type of protein of each dish: beef, pork, seafood, etc. 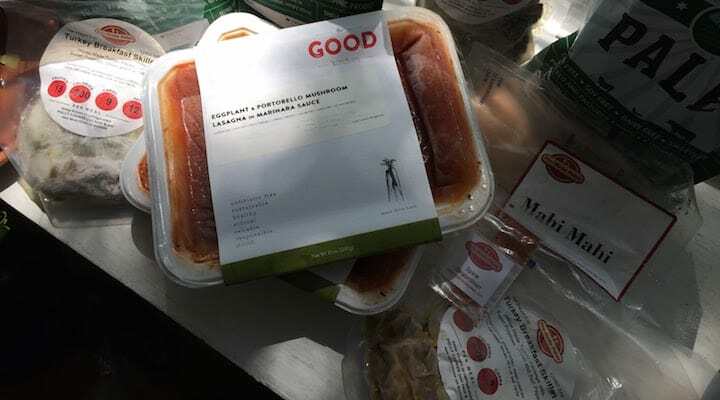 The Good Kitchen allows customers to order either a recurring meal plan or one time order with free shipping on all orders (a minimum of 5 meals is required for each order). Meals are shipped in vacuum sealed to-go containers that are easy to heat up in the microwave at work or on the go. See thegoodkitchen.com for their complete menu. Richard Bradford, the owner and executive chef of True Fare also happens to be an advocate of the Whole30 (he writes the #AskChefRichard column on the Whole30 website and has contributed recipes to The New York Times bestselling Whole30 Cookbook). This means that True Fare’s meals are created following Whole30 principles, but in addition True Fare meals have been approved by the Whole 30 organization. True Fare (formerly named Pre-Made Paleo) will deliver their meals either fresh or frozen, straight to your door. The company prides itself on using only organic produce and offers a range of meals made from wild-caught fish and hard-to-find game – like grouper with black kale and pumpkin pesto, or wild boar chorizo. If you want to do the Whole30 challenge without the hassle of cooking, True Far offers you meal plans that cover anywhere between 5 and 30 days. If you’re interested in keeping a few meals on hand, you can order breakfasts, lunches, and dinners a la carte. The company also offers a whole line of time saving products like bone broths, spices, and Whole30 compliant snacks. If you’re looking for a bit of help with your challenge, this company is definitely worth checking out. See truefare.com for prices and Whole30 approved meal delivery plan options. While Paleo on the Go specializes in creating Paleo-compliant meals, they’ve also recently incorporated a line of meals they are calling their “Strict 30.” This menu “aligns with other popular and effective 30 day ‘reset’ plans” and cuts out dairy, soy, grains, legumes, and artificial sweeteners, making it compatible with the Whole30. 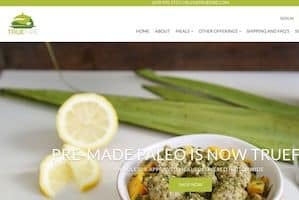 For those who are trying the Whole30 challenge as a way to improve their health, this is a great company to order from, as Paleo on the Go specializes in crafting meals for customers with dietary restrictions and autoimmune conditions, so as an example they have gone the extra step of operating a dedicate gluten free kitchen to cut down on the possibility of cross contamination. Paleo on the Go has a network of farmers and vendors from whom they source most of their produce and proteins. Their vendors are listed on their website. They source organically any ingredient that appears on the Environmental Working Groups “dirty dozen” list (strawberries, spinach, etc) and, to keep costs down, source conventionally foods that appear on the clean 15 list (avocados, onions, etc). Their Strict 30 menu is a mostly a la carte menu, offering enticing options like elk burgers with wild mushrooms, turkey tetrazzini, and breakfast scrambles. They also offer a 5-meal variety pack. If you plan on re-introducing certain food groups to your diet, following your initial month of Whole30, you might find yourself continuing to order from Paleo on the Go. 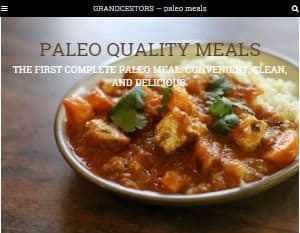 See paleoonthego.com for prices and Strict 30 / Whole30 delivery meal options. Caveman Chefs is a Colorado-based company that sources its produce and protein from local farms and ranches. While Caveman Chefs specializes in cooking Paleo, they have a meal plan dietary preference option specifically for customers following the Whole30. When creating your plan, simply select the Whole30 option (which comes in medium, large, or extra large meals sizes). Caveman Chefs creates its dishes using grass-fed meats, local and in-season produce, and wild-caught fish. For customers with dietary restrictions, including those seeking to get Whole 30 meals delivered, Caveman Chefs attempts to customize their meal plans to meet your specific dietary restrictions. Unlike the previous two companies, Caveman Chefs require that customers order a minimum of 24 meals, so it is a bit more of a commitment. If you live in Colorado, you can pick up Caveman Chef meals from several local locations. If you don’t live in Colorado, no problem: The company ships nationally. Visit http://www.cavemanchefs.com for more information on their Whole30 meal delivery services. Caveman Chefs has offered 10% off all orders by mentioning the promo #ZachmyPALeos in the order comments or mentioned by phone during checkout. The following companies on our list are meal delivery websites that ship meals nationally and specialize in creating meals for the Paleo Diet. While these companies may not offer meals that cater explicitly to the Whole30 challenge, this doesn’t mean their meals aren’t Whole30 compliant. As we’ve discussed above, many of the tenets of Paleo are similar to those of the Whole30 challenge. The main difference to be aware of is sugar: Paleo allows for the addition of honey, maple syrup – anything that isn’t refined sugar, while Whole30 cuts out all artificial sweeteners. Paleo also allows for ingredient substitutions to re-create healthier versions of processed foods. The Whole30 challenge advocates changing your eating mentality. If you’ve examined the other options and are looking for a wider selection of meals and meal plans, take a look at the following companies on our list. While you may want to review the ingredients listed, we’re certain you will find more than a few meals that meet your dietary restrictions. While Pete’s Paleo doesn’t advertise itself as Whole30 compliant, Pete’s uses fruits and vegetables to naturally sweeten their meals; they exclude even honey and maple syrup from their cooking. 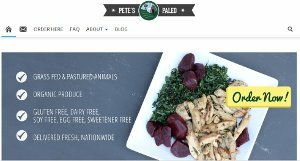 Pete’s is a go-to company for Paleo customers looking to do a sugar detox and, as such, is also a great fit for customers who are looking to comply with the restrictions of the Whole30 challenge. Pete’s is another company that requires customers to purchase a meal plan, but meals rotate weekly and are based entirely on the availability of seasonal produce. You can order as few as five meals, and there’s always something new to try (like their tenderloin au poivre with mashed sweet potato and roasted broccoli). Still not sure if Pete’s is right for you? Check out their long list of testimonials. See petespaleo.com for a complete list of prices for potential Whole30 meals delivery and Whole30 meal service options. Trifecta Nutrition might also be a great option for customers looking to embark on the Whole30 challenge. The company focuses on nutrition to enhance an active lifestyle, and they advertise several different meal plans. While their vegan, vegetarian, and clean eating plans are popular, customers doing the Whole30 challenge might be interested in their Paleo Plan. While Trifecta Nutrition doesn’t allow for as much customization as some of the other sites on this list, they do allow customers to specify dietary restrictions. Any meals that contain the listed ingredients will be excluded from your meal plan, and other meals will be substituted. Trifecta also has a great option for Whole30 customers: they allow you to purchase a la carte items in bulk. 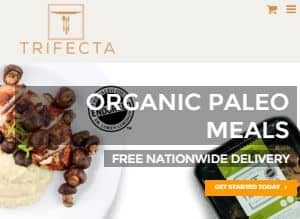 If you’re interested in portioning your own meals, it might be worth your while to order a few of Trifecta’s already cooked items like bison, flat-iron steak, mixed vegetables, or mashed sweet potatoes. Best thing about Trifecta? The shipping is free! See trifectanutrition.com for current prices and their options for Whole30 premade meals and providing a Whole30 food delivery service. If you’re a fan of cooking and are simply looking to keep a few emergency meals on hand, you might be interested in checking out your local supermarket or health food store for Whole30 Compliant frozen meals. While availability is definitely limited depending on where you live, this doesn’t mean you won’t be able to find something near you. If you live in Colorado, Idaho, Kansas, New Mexico, Oregon, Utah, or Washington, you should be able to find Grandcestors’ line of Whole30 approved meals in your local Whole Foods. The Colorado-based company offers a line of seven different entrees (like Chicken Tikka Masala, Meatloaf, or Colorado Hash) that use grass fed, free range protein, organic produce, and balance proteins, healthy carbs, and fats. Their meals are low in calories and are ready after just a few minutes in the microwave. Even if you live outside of Grandcestors distribution network, you can order their meals online, and they’ll ship straight to your door. For our detailed write up on Grandcestors possible including Grandcestors froen meal reviews and options for Whole30 home delivery, see our in-depth coverage on them . In addition to the companies we covered so far that offer Whole30 approved meal delivery or Whole30 compliant freezer meals available at your local health food store, there are times when you might be searching for a last minute Whole30 takeout options instead. This is often the case if you haven’t planned ahead, and do not have meals ready to go in your freezer. Here are a few more tips for trying to get Whole30 meals delivered in your city. First, if you’d be interested in local catering or meal prep company with a kitchen in your city, where you can drive over and pick up grain free, gluten free meals, we have written a series of articles on local Paleo companies in specific cities in our city specific meal delivery series (for example if you are looking for Whole30 meal delivery Los Angeles companies, Whole30 meal delivery nyc companies or Whole30 meal delivery Chicago companies we have articles on those cities). You might take a look and see if your city has an article on local Whole30 delivery food specifically tailored to your area, we have covered over 80 cities in the U.S.
Second, if you are really only looking for restaurants in your city, Yelp can be a decent resource for finding restaurants with some Paleo compliant meals on their menus based on user reviews. Just keep in mind that 80% of what people often recommend as Paleo or Whole30 probably won’t qualify as truly Whole30 compliant, so you’ll have to do your own research and possibly call the restaurant to confirm all the ingredients used in the meal. These days, even if the restaurant doesn’t deliver, you can often use a service like Postmates to pick up the meals and deliver them to you. It’s not necessarily the restrictive nature of the Whole30 challenge that keeps people from completing it; rather it’s the difficulty of finding the time to shop for and prepare Whole30 compliant meals. If you’re ready to commit to thirty days of being grain, dairy, legume, and sugar free, there are plenty of companies offering premade Whole 30 meals that will help you maintain your healthy eating. What we hope you’ve been able to glean from this article are some solutions for when you’re too busy to commit to cooking. It’s also important to consider that one of the biggest difficulties on the Whole30 challenge is maintaining healthy eating when you’re away from home. Many of the sites on our list ship meals in packaging conducive to travel – something to consider! Rather than falling off the wagon, or starting the Whole30 challenge over again, prepare for the challenge by stocking up on some emergency meals. Better yet, order an entire 30 days’ worth of meals. With so many companies that deliver pre-made Whole30 compliant meals straight to your door, there’s no reason not to give the Whole30 challenge a try.